Speaking of debates, man oh man is there one about what fats to use in a pie crust. I like harmony and sharing, so I use them all! Butter for flavor, shortening (either regular Crisco or the much more expensive and possibly healthier-? ?-Spectrum Organic Shortening) for flakiness, and a little lard thrown in for absolute awesomeness. I know it sounds sketchy to use lard, but it’s not. You can buy an ominous block of it at the grocery store, but that kind is partially hydrogenated (fat from an animal at room temperature! ), so I get the good stuff from a farmers’ market. Sometimes it’s called leaf lard. Here in Austin, I’ve tried lard from two different farmers, and my favorite is from Dai Due (cutest packaging ever, who would have thought), at the downtown farmers’ market. I do NOT like to wake up early on Saturday mornings, so you know if I get up early for lard, it must be worth it. If you are not convinced, you can of course make a pie crust with only butter (Smitten Kitchen does it) or only shortening (Pioneer Woman does it), or I suppose even only lard (although your pie might smell like a pork rind). Just make sure your fat totals to 1¼ cups. In this recipe, you cook some of the fruit ahead of time so that you can taste the fruit and adjust the sugar and lemon juice to your liking. If you’re feeling lazy and non-particular, however, feel free to just stir the mixin’s all up and pour ’em in the pie without this step. Fresh blueberries are best, but frozen are OK, too—they taste fine, it’s just the texture that suffers a bit. Cut the stick of butter into small cubes and put back in the refrigerator. Do the same with the shortening if you’re using sticks of Crisco. If you’re using the Spectrum shortening, scoop out shavings of the shortening (it gets quite hard in the refrigerator) until you have a half cup (pack it in a bit), and put that in the refrigerator. Make sure your lard is also nice and cold. Put more water than you’ll need in a large cup filled with ice, and yep, you guessed it, stick this in the refrigerator. Wash and drain your blueberries. Wash the lemon. Take out two pieces of plastic wrap and set them on the counter. Mix the flour and salt in a large bowl. Add the chilled butter. Use a pastry blender to cut in the butter (i.e., press into the mixture so that the butter is cut into smaller and smaller pieces, which are then coated in the flour). Keep doing this until your mixture looks like coarse crumbs. Add the shortening and lard. Cut in the shortening and lard until the mixture has small clumps and curds. You do not want any large clumps of fat remaining, but small clumps (pea-sized or so) are good—they add to the flakiness. Measure ½ cup of water from your chilled ice water, and very lightly drizzle some the water over your dough a little bit at a time, stopping frequently to stir lightly with a wooden spoon. After you’ve drizzled some of the water, you will start to see some parts of the dough stick together, while the rest of the mixture is still a mound of crumbs. Concentrate the rest of the half cup of water onto the crumbs, a tiny bit at a time. When you have incorporated the entire half cup of water, use your hands to fold the dough over itself a few times. If it will hold together like a ball (albeit a somewhat beat up, crumbly version of a ball), you do not need to add any more water. If, however, it crumbles and falls to pieces when you try to press it into a ball shape, add a bit more water, a teaspoon or two at a time, to the driest looking parts. Lightly mix with your hands until the dough will hold together. Use a knife to cut the dough into two equal pieces. Shape each piece into a ball in your hands and place on the plastic wrap. Press into a disk shape and wrap in plastic. Preheat oven to 375°. Line a baking sheet in tin foil. Roll out the first crust on a lightly floured surface. Pat the surface gently to look for any thick spots. 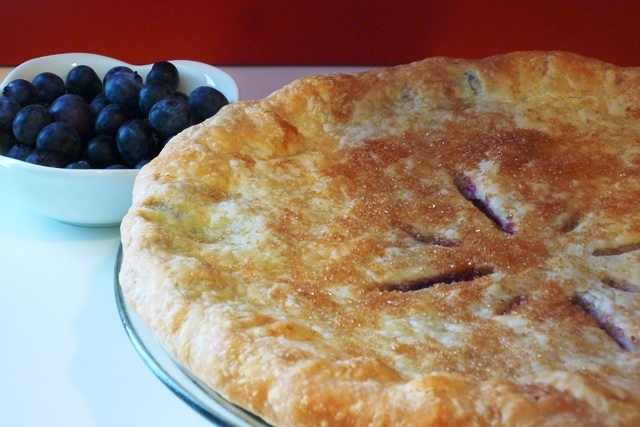 When your crust is big enough, place the pie plate right next to the crust. Roll up some of the crust over the rolling pin, and gently slide the crust onto your pie plate. It’s fine to have some extra around the edges, but if more than one inch is overhanging, simply pull the extra off using your hands. Use these pieces to patch any cracks (use a tiny bit of water as glue). Cook half of the fruit, along with ¾ cup sugar, the flour, and the cinnamon, on top of the stove on medium-low or medium heat. Stir fairly often to avoid burning the fruit. While the fruit is cooking, roll out your top crust, stopping to stir the fruit frequently. Bring the fruit to a boil, and stir and boil for one minute. Turn off heat. Stir in remaining fruit, lemon zest, and lemon juice. Taste, and add more sugar and/or lemon juice to your liking. Pour filling into pie crust. Dot top with butter. Transfer top crust to pie plate. Gently fold top crust under the overhanging edges of the bottom crust. Then, using the forefinger of one hand and the thumb and forefinger of the other, crimp the crust so that it is sealed. Cut 4–8 slits in the top of the pie. 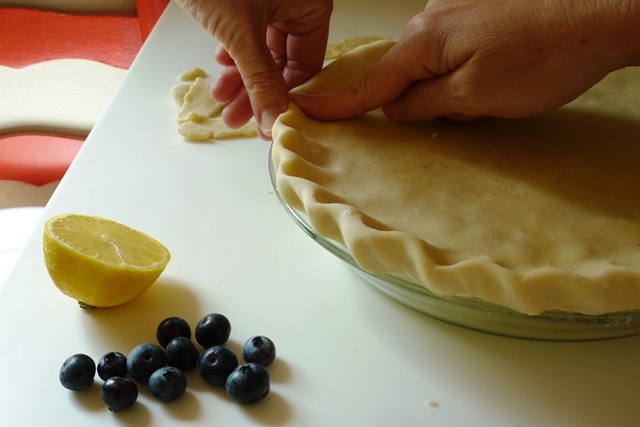 Dip your fingers in water and gently wet the surface of the pie. 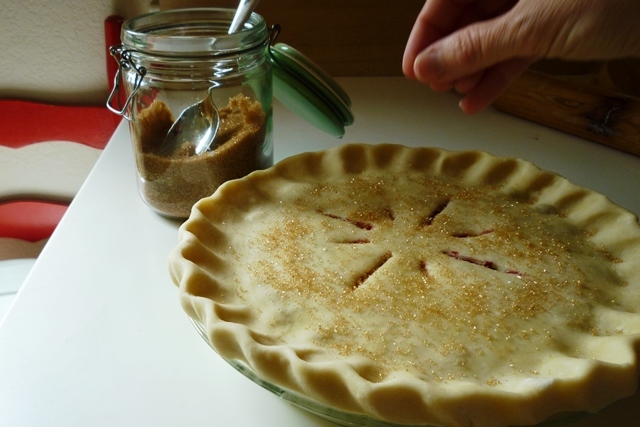 Then sprinkle turbinado sugar (regular sugar will work, too) over your pie. 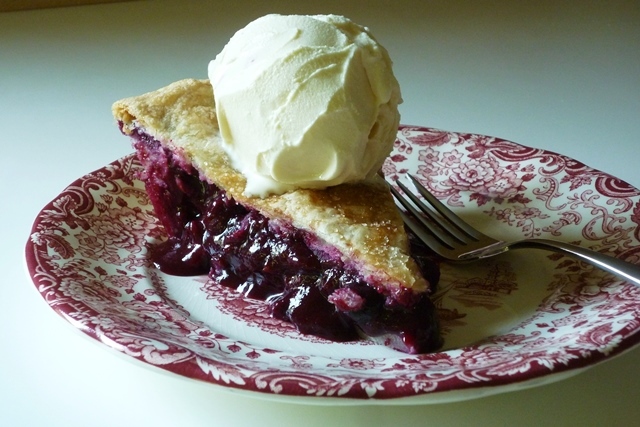 Place pie on foil-lined baking sheet, and bake at 375° for 45–50 minutes, or until the top is golden brown and you can see the fruit bubbling up a bit through the slits. Let the pie cool on a wire rack for at least 30 minutes before cutting. Enjoy!